FA: Todd Stevens and Troy Anderson. From Springdale, Tooele (too-ill-uh) Tower is the tallest individual tower (not the tallest in elevation) of the Eagle Crags group. It is also the eastern-most or left tower. The route begins from the col on the northwest side in the best looking crack. The route is like most tower routes in the desert: classic but a little loose at times. Expect some wind. 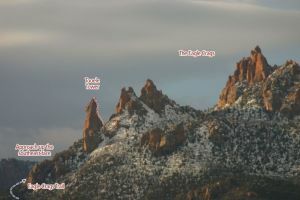 Which SuperTopo guidebooks include a topo for Tooele Tower?